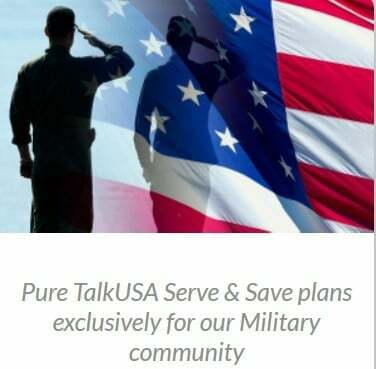 Pure TalkUSA, an ATT MVNO has recently launched some newly discounted plans aimed at current and former USA military members. The new military plans are entitled "Serve & Save" and the MVNO has teamed up with Shop Your Way and ID.me to bring you those plans as well as a few other benefits. Specifically the plans are available to all active Service & Dependents, National Guard, Reserve, Retirees, Veterans, ROTC scholarship cadets and USAA members. A breakdown of pricing and features compared to Pure TalkUSA's regular plans are listed in the table below. Overall the discounted plans aren't significantly cheaper than competitors plans. Pure TalkUSA's $26.95 plan offers 500 MB of data which is cheaper than every other ATT MVNO that includes that amount of data albeit only by a nickel. The $31.95 plan which offers 1 GB of data is also cheaper than any other ATT MVNO that offers a similar amount of data, however, unless you really need to save, Cricket Wireless's $35 plan offers a better value as it includes 2.5 GB of data. Shop Your Way is a free social shopping network that offers a rewards program and personalized services and advice. Through a network of retail partners the site is able to offer members comparison shopping as well as the ability to earn points to use on future purchases. Members are also privy to special pricing and exclusive sales. ID.me is used to securely verify military status for all military members. Shop Your Way also uses ID.me.